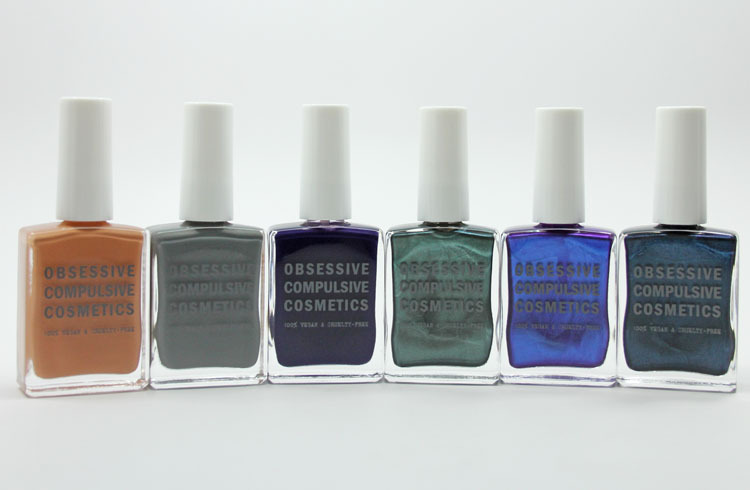 The Obsessive Compulsive Cosmetics Unknown Pleasures Nail Lacquer collection hits online stores soon and I’ve got some swatches for ya! Taken from the New York Fashion Week runways, the shades in this collection are on trend yet super edgy and cool. There are some cremes and some amazing metallics in the 6-piece collection. All are limited edition except for Dangerous. The collection will be available online at Sephora.com, Beautylish.com, and OCCMakeup.com beginning August 5th, and available for purchase at participating Sephora stores and at OCC’s flagship boutique on September 19th. Covet is a buff/camel creme. This had a really good, if a little thick, formula. I love this shade because it’s unusual and kind of ugly/pretty. This was two coats. Dangerous is a medium/deep grey creme. This is the perfect grey creme. You can see a little bit of blue in it, which I love. The formula was excellent it was nearly one coat but I used two. Pagan is a blackened purple creme. This baby is super dark, nearly black looking, but not quite. I did use three thin coats because it wasn’t completely even with just two. Very glossy! Poison is a shimmery ivy green metallic. Loving this dark green color, though it is a little bit brush-stroke-y if you aren’t careful. It covered really nicely with two thin coats. Technopagan is a blackened purple with blue pearl metallic. This is nearly as amazing as the Lip Tar with the same name, but not quite – but only because that Lip Tar is freaking INCREDIBLE! This color is gorgeous, rich and the formula was excellent. This was two coats and it’s less brush-stroke-y than Poison was. Distortion is a dark shimmery navy blue metallic. I like that it’s not so dark that it looks black, you can definitely tell it’s blue. This was a wee bit brush-stroke-y, but again not as much as Poison. Two coats covered really nicely. I like all of these shades but am especially in love with Covet, Technopagan and Poison. Which of these shades are you coveting?